It was in my last year of primary school that I realised I was a socialist and a radical. We were learning about the Highland Clearances – Fuadach nan Gàidheal, the Expulsion of the Gaels – which saw tens of thousands of people forcibly transported overseas or evicted to the overcrowded, rocky coast in the name of economic progress. And then the bombshell: the estate owners, the landed classes who had tried to empty half of Scotland, were still here, hunting, fishing, and landlording it over the natives in the 21st century. But not for much longer. It was 2005, and the island I grew up on – Eriskay – was bought, alongside neighbouring South Uist and Benbecula, for £4.5 million, not by another syndicate of deerstalking families, but by people of the islands themselves, to be held under community ownership. It was the culmination of over a century of struggle, of which most of Britain – reared on tourist-friendly tales of the wild ‘heilans’ – is completely unaware. After the Clearances of the 19th century, crofters in the Highlands and Islands, inspired by the Land League in Ireland, began to campaign for rights of tenure. The Highland Land League had as its slogan “Is treasa tuath na tighearna” (The people are mightier than a lord), and with its newspaper An Gàidheal (The Highlander), inspired and organised radical action such as rent strikes and land raids. In 1882, after having been denied access to what they saw as their rightful common grazing land on Ben Lee, the crofters of the township of Braes on Skye, with their wives and children, fought the police who had been dispatched to extract rent from them. The ‘Battle of the Braes’, as the newspapers dubbed it, inspired similar acts of resistance in Skye and Lewis. In response, in 1883, the Napier Commission took evidence from crofters all over Gaeldom of landlords’ abuses during the Clearances and after, and public opinion began to turn in favour of the crofters. In 1885, the Highland Land League returned four MPs, Britain’s first ever working-class MPs, and the ruling Liberal government was moved to pass the Crofter’s Act of 1886, which guarantees security of tenure and inheritance to crofters. Yet, though this legislation succeeded in its aim of preventing a repeat of the Clearances, the inequitable pattern of land occupation prevailed. Thus, land raids continued apace until 1914, and peaked after the First World War, when soldiers returning home from the Front discovered that Lloyd George’s manifesto promise to forcibly buy land back from the landlords was illusory. 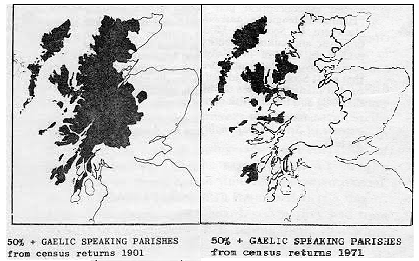 Gaelic Scotland suffered some of the highest casualty rates in the British Empire, and understandable bitterness drove direct action like the Vatersay Land Raids of 1906. However, despite landlords being forced by default to give land up to the raiders, these direct actions did not solve the problem of concentrated land ownership. Land reform stalled until the 1970s, when the agitprop theatre company ‘7/84’ and the radical (now the UK’s first wholly employee-owned) newspaper the West Highland Free Press inspired the people and politicians to finally tackle the issue that 84% of Scotland was controlled by just 7% of the population. Finally, after the people of Eigg bought their island from an absentee landlord, the Scottish Government in 2003 legislated for a right to buy, so that any community that so desired could buy their own land back, even against the wishes of the landlord, making radical land reform a right in law. The land on which many of our lairds sit was stolen in the 17th century, but these ill-gotten gains were protected by acts which maintained their hegemony after the rest of Europe ditched feudalism and concentrated land ownership. But the quest for a fair pattern of landownership has not been easy. 432 private owners control half the land in Scotland, a quarter of the country is still sporting estate and, as Figure 1 shows, much of the Highlands remain in the hands of the 50 largest estates. The community of the 26,800 hectare Pairc estate on Lewis, whose starving ancestors took part in the infamous Deer Park Raid of 1887, fought in the courts for over ten years, and only now in 2013 were able to come to a deal to purchase the land from an obstructive landlord. Landlords have begun to speak out, defending themselves. In BBC Scotland’s The Men Who Own Scotland, broadcast in January 2014, James MacKenzie, defended the fact he owns 53,000 acres across Scotland by quipping “it may not be fair but is it fair that your wife is prettier than mine, that you win the lottery when I don’t?” This kind of fatalism, which presumes landownership patterns arising unjustly in the past should just persist for the sake of preserving the sanctity of private ownership, has retarded progress for decades. But the Scottish National Party (SNP), led by environment minister Paul Wheelhouse, after years of avoiding what in Gaelic is termed Ceist an Fhearainn – the Question of Land – have decided to face up to what James Hunter calls “the most concentrated, most inequitable, most unreformed and most undemocratic land ownership system in the entire developed world,” by, for example, giving tenant farmers the undisputable right to buy the land they work from even unwilling owners. And Lesley Riddoch, an influential nationalist journalist and thinker, in her book Blossom, has named these land reforms as a major priority for social justice in an independent Scotland. The Scottish Crofting Foundation calls on government to: recognise crofters as indigenous people of the Highlands and Islands; respect the growing body of international law on indigenous peoples; and devolve power and decision-making on indigenous issues to the people who maintain the indigenous cultures of the Highlands and Islands. The infamous Clearances in the Highlands were not just a process of physically dispossessing Gaels, they were also a process of dislocating them from the minds of Scots, especially those with power and privilege, and placing Gaelic culture firmly in the “dustbin” of history, where it need not concern or trouble any “civilised” person. There are still academic volumes being published by scholars on “Scottish” history and literature and any number of subjects which make no mention of Gaelic culture, as though Gaels were not bone-fide Scots or people who mattered. The West Highland Free Press has as its slogan An Tìr, an Cànan, ‘s na Daoine (The Land, the Language and the People), showing how intertwined issues of cultural and territorial decolonisation have been viewed in Gaeldom. Over the past century or so, Gaels have dwindled in number from 230,806 in 1901 to 57,375 in 2011. 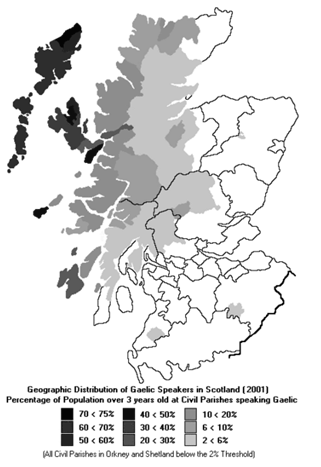 By 2011, only 51.7% of Gaels were living in so-called ‘heartland’ Highland areas, and the incidence of Gaelic-speakers in the language’s last stronghold of the Western Isles was now just at 52%, a 10.5% drop since 2001, showing the effects of wholesale language shift, depopulation and Anglophone in-migration. This process of language death is summarised in Figures 2 and 3. Anecdotally, I first began to explore ideas of indigenous land use to understand Gaelic Scotland after meeting Alastair MacIntosh at an Eco Festival in Uist in 2010. I was taking part in a panel discussion alongside MacIntosh, a geographer from St Andrews University, and an (incomer) representative of Sustainable Uist, a sustainable development organisation from the Western Isles. The crowd was large and there was much self-flagellation among the assembled academics and eco-activists about how hard it was to get local crofters involved with their sustainable development schemes – indeed, not one crofter had even turned up to the Eco Festival. I vividly remember the perplexed silence when I pointed out that the weekend they had chosen to host the festival on coincided with one of the busiest weekends of the crofting calendar (Là Buidhe Bealltainn, Mayday, when livestock are moved to the common grazing) so no wonder no crofters had put in an appearance. This was illustrative of the social divide that persisted between environmentalist ‘white settlers’ and the indigenous crofters, and showed the problem of allowing the debate over Highland development to be dominated by outsiders. ‘White steriliser’ culture sees the value of the Highlands as a wilderness as trumping economic development or active land use. For example, Scottish Natural Heritage, buttressed by the John Muir Trust, recently drew up a map of proposed wildland designations in Scotland, scenery deemed too precious for development. As Figure 4 shows, this includes a huge swathe of South Uist community estate. The so-called ‘Wild Land’ of South Uist has been occupied, managed, altered, built on and farmed by island residents for thousands of years. Calling it an untouched wilderness disparages the long history of island living and imposes a romanticised and erroneous external construct on this community that will perpetuate the economic decline of the island economy. […] Much of Scotland was once designated as land fit only for sheep, which resulted in the Clearances. If Scotland continues to be designated as fit for nothing but conservation, a new clearance of rural Scotland will take place. I believe strongly that an independent Scotland should not be a colonialist nation. If Scotland’s raw wealth is to be based on the riches of the seabed surrounding these three archipelagos (whether oil, wave and wind power or fisheries), then a truly socially-democratic Scotland must give the islands it exploits the right to benefit economically from their own resources. rinneadh fuadach thar sàile. who were driven over the sea. The economic processes which exploited the Gàidhealtachd, consolidated the power of the landowners and still sends its young people to the cities for work, housing and opportunity is the same process wreaking havoc elsewhere. If you want to get an understanding of the experience of those marginalised by economic exploitation, then a genuine engagement with an exploited culture close to home, is in terms of sheer practicality, a good place to start. Dòmhnall Iain Dòmhnallach (or D.I. MacDonald) is a 2nd year Biomedical Sciences student at St John’s College, Oxford. He is the President of Oxford Atheists, Secularists and Humanists and Nominal President of the Failed Novelists society. He is currently setting up a new Gàidhlig language online magazine called Dàna. Dòmhnall Eachann Meek (ed. ), ‘Mairi Mhòr Nan Oran: Taghadh De a h-Orain.’ Glasgow: Gairm, 1977 (pg. 221). Translation by Dòmhnall Iain Dòmhnallach. ibid (pg. 108). Translation by Dòmhnall Iain Dòmhnallach.